You&apos;ve barely started in your new job, but requests are coming in fast! The local tourist bureau is running a promotion where they provide tourists with a GPS device to help them visit street food vendors in the city. Your manager wonders whether you can use FME to produce the data to be used in this scheme. Let&apos;s get onto that right away shall we?! Click OK to accept the parameters. 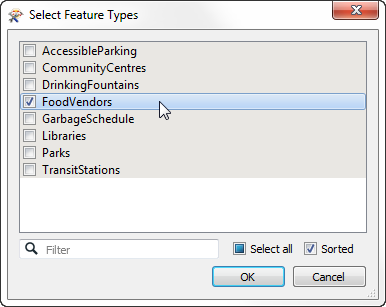 When prompted which tables to use from the source data (there are several) deselect all tables except for FoodVendors and click OK to create the workspace. The technique of connecting objects like this is called Schema Mapping, and we shall learn more about it later. Save the workspace so you have a copy of it, then run the workspace by pressing the green play button. The workspace will run and the data written to a Garmin POI dataset. Go to the FME Data Inspector. Select File > Open Dataset from the menubar. This opens the dialog titled "Select Dataset to View". 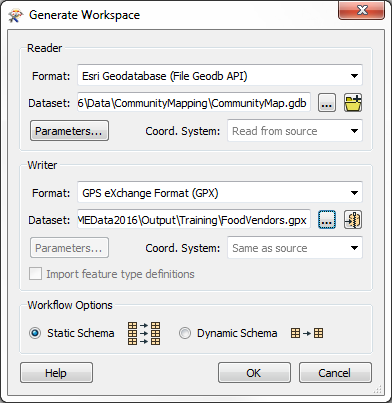 Set the format type and select the GPX dataset. However, the GPX format does not record its coordinate system inside the dataset, so to include a background map you must also set the coordinate system (LL83) in this dialog. NB: Because of the coordinate system limitation for this format, you can&apos;t use the Inspect options inside Workbench. That&apos;s because the data will be passed directly to the Data Inspector without the option to set the coordinate system. You have to open it manually as above. Click OK and the dataset will be opened for you to verify that it is correct. All this talk of food is making you hungry. It must be lunchtime. To find somewhere to get a quick lunch filter the data to show hot dog vendors in the city.